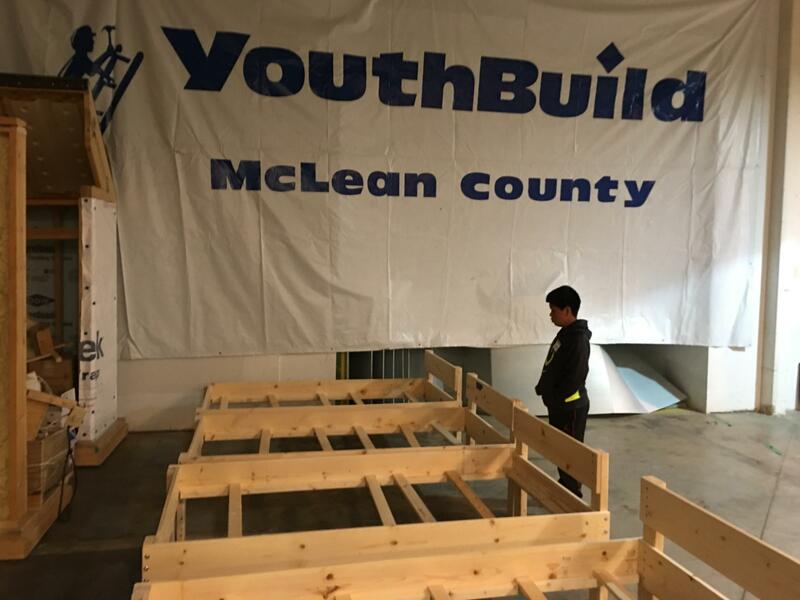 Finished bed frames at the 2016 Bed Blitz. 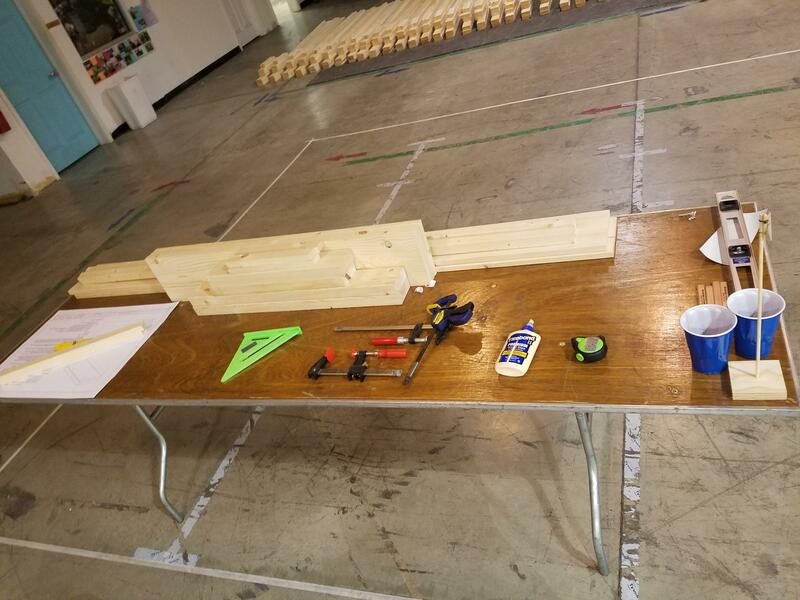 Everything a volunteer needs to build a bed for the WBRP Bed Blitz. Every day starts with a good night's sleep, according to Ryan Heeren. 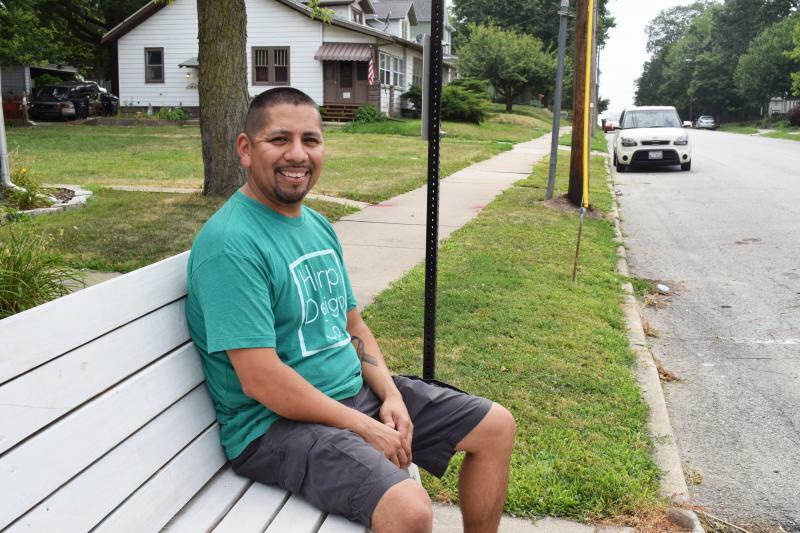 He and Robert Bosquez are with the West Bloomington Revitalization Project's Tool Library and helping to organize the Bed Blitz, a volunteer effort to build and provide beds to kids sleeping on the floor, on furniture, or with family members. "If you're sharing a bed or if you're on a cold or uncomfortable floor, it's difficult to get your day started on the right foot and that translates into school and performance," Heeren said during GLT's Sound Ideas. "One of the things, also, that a bed provides is a private space for a child, a place to do homework, to cozy up and read a book, just to kind of get away from it all and reset." A team works on one of 40 beds completed in the 2016 Bed Blitz. This year the goal is 80 bed frames. Bosquez said he talks with teachers about kids struggling in school and the number one thing they tell him is that the child didn't get a good night's sleep. The WBRP Bed Blitz is patterned after a program at Morehead State University in Kentucky. Heeren and Bosquez said they'd heard about the need for beds in the community and confirmed that need with Recycling Furniture for Families. The organization confirmed their number one need is beds. Heeren said he also heard from those using the tool library about the need for beds. "Even then we still struggled to believe that until last year. We sent out our applications not really sure what to expect, and we had 106 applicants in that first year and that's what really solidified that this was a need in the community," said Heeren. Last year, volunteers built 40 beds. This year, the Bed Blitz hopes to complete 80 beds. So far, 30 applications have been returned, but Heeren expects a flood of applications near the deadline and could end up with 80 to 100 applications. And Heeren said seeing applications decrease in a future year would be a sign of success. "I think we'll continue to do this program annually until we stop getting applications. When that happens, we'll consider this a success and move on to the next event," said Heeren. Heeren said a bed, mattress, boxsprings, sheets, pillows and more can cost a low-income family $200-400. Combine that cost with first and last months' rent and a security deposit and often families are not able to afford beds for children. The WBRP has arranged for not only a bed frame, but everything else needed to go with it, including handmade quilts. 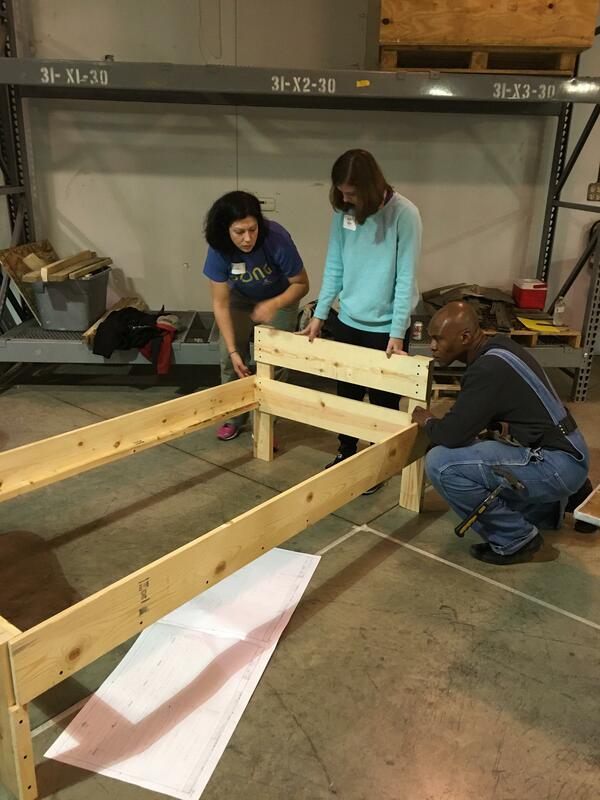 Twenty-five, four-person teams are still neededed for afternoon shifts on Oct. 14 to build the bed frames. Bosquez said all the lumber is precut and sanded. Fasteners and tools are provided. Funding comes from individual contributions and local and national grants. "Let's make no mistake about this. Bloomington-Normal is a great community," said Bosquez. "When there's a need, they step up." Volunteers or bed building teams can still sign up to help. Applications for beds are accepted until 7 p.m. Sept. 21. An excerpt from GLT's story about the Bed Blitz. GLT's full story about the Bed Blitz. A group of west Bloomington volunteers are taking a stand to help their neighbors take a seat. Two-dozen benches are being installed at Connect Transit bus stops on the city’s west side. The first five are already on place on Washington Street, with more to come on Market Street.